The open office revolutionized the modern workspace, allowing for easy collaboration and cost effective design. Along with the perks, there also came challenges with this new layout, as lack of privacy, and noise distractions started to make people rethink the design of the open office. 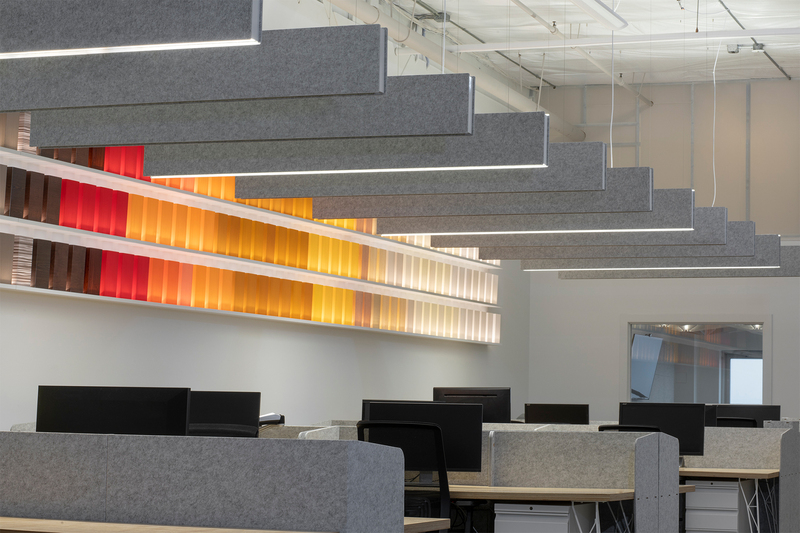 We reached out to acoustician and LightArt acoustic consultant Zackery Belanger to better understand some challenges that can occur with the open office plan. Be sure to check out the video we made with Zackary discussing the open office plan, Acoustical Challenges in the Modern Open Office. Open offices take a pass on walls that block sound, leaving direct line-of-sight paths for sound transfer. Sound also easily reflects off hard ceilings, floors, and furniture. Achieving privacy requires a nuanced mix of full enclosures, partial enclosures, intelligent space planning, reflective and absorptive materials, and suitable background noise. A great example of incorporating private and semiprivate spaces for teams or individuals to break away to. This spaces allows staff room to work on different projects simultaneously, without distracting their colleagues. 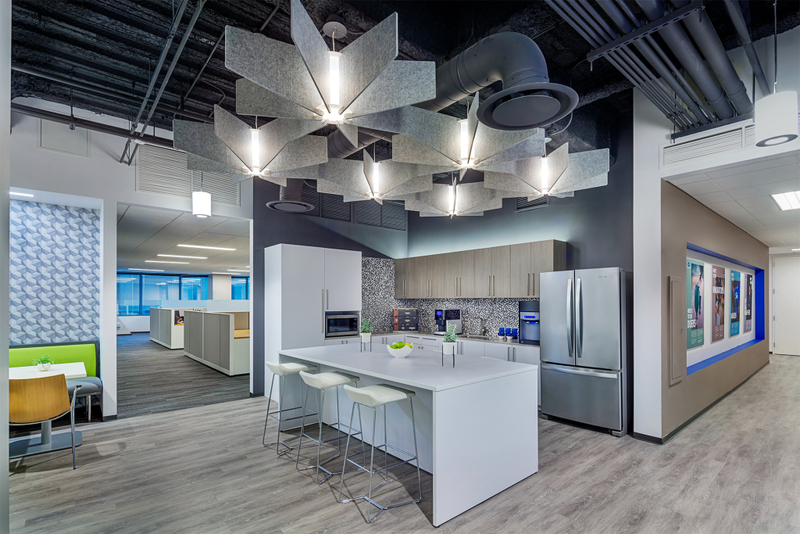 The designers used the high-performance Static beams that work as both an acoustical treatment and lighting solution. Click here to learn more about this project. 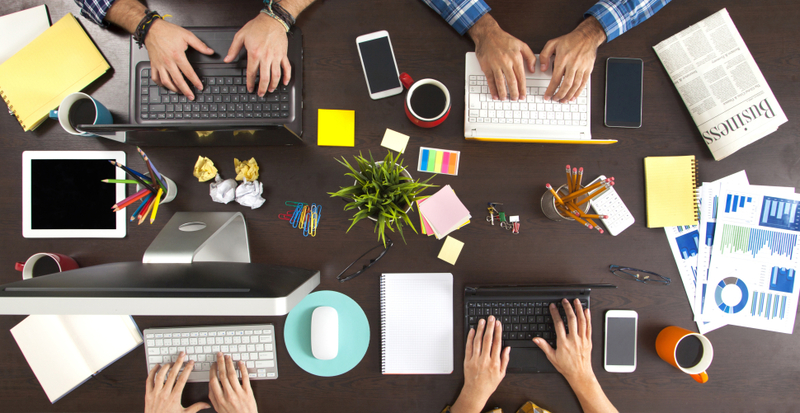 Talking, HVAC noise, open kitchens, exterior sounds of traffic, thunder and rain, and even keyboard and furniture sounds: open offices invite noise. Keeping it quiet requires careful space planning, the right finish materials and sound-absorbing objects, and attention to the details of the building envelope. To help mitigate sound traveling into the work space, this open kitchen incorporated Echo, a lit acoustical ceiling grid. Designers thoughtfully placed the Echo grid around a common gathering spot in the space, as well as strategically around the HVAC system. The Echo grid, along with plush pieces of furniture, will help keep sound distractions at a minimum in the space. Learn more about this project here. 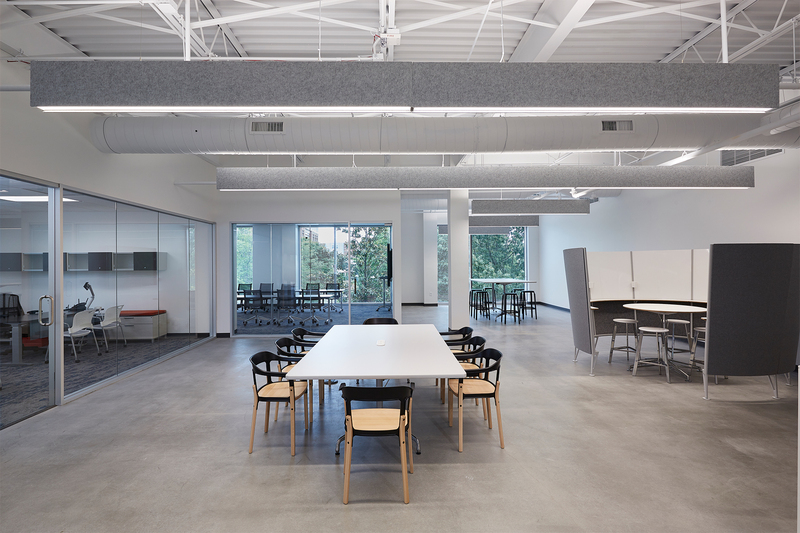 Noise is always present in open offices, but with the right layout of spaces, materials, and intentional background noise it can be kept from becoming distracting. Background noise can be controlled with dedicated sound masking systems, which evenly distribute a pleasing blend of sonic frequencies. Sound can find its way along unexpected paths. Hard concave surfaces like curved walls or domes can focus sound so it can be heard clearly across a room. Avoiding or mitigating such conditions requires acoustic absorption and barriers that are targeted to the unique paths of sound transfer. Open offices introduce many benefits, from collaboration to cost savings, but they come at a price acoustically. Accepting compromises and designing for the best acoustic conditions means consideration of all factors that affect sound and making informed decisions that best meet the goals of the client. Open offices come with a multitude of benefits, like creating exciting design challenges that allow for collaborative work. The aim is to keep the team and individual comfortable, happy, and focused in their work space. Click here to learn more about this project. Zackery Belanger is a acoustician, researcher, and designer; founder and principal of Detroit-based Arcgeometer.